Mochi (Japanese: 餅; Chinese: 麻糬) is a Japanese rice cake made by pounding glutinous rice into a paste and molding it into shapes which can be eaten right away, or cured and dried for later use. Mochi is used to make a variety of traditional Japanese sweets, and cooked in soups. It is also popular toasted and dipped in a variety of flavorings. Toasted mochi inflates to several times its original size, forming a crisp crust with a soft, chewy interior, and is especially popular in cold weather. In Japan, mochi is traditionally made in a ceremony called mochitsuki, in which people take turns wielding the heavy wooden mallets. While also eaten year-round, mochi is a traditional food for the Japanese New Year and is commonly sold and eaten during that time. A decoration called kagami mochi (mirror mochi), formed of two spheres of mochi, one on top of the other, and topped with a bitter orange (daidai), is placed on the family altar during the New Year. Pounding mochi in an usu. Making mochi with a machine. Mochi is made with glutinous rice (Oryza sativa var. glutinosa or Oryza glutinosa); also called sticky rice, sweet rice, waxy rice, botan rice, mochi rice, and pearl rice, type of short-grained Asian rice that is especially sticky when cooked. The rice is cooked and then pounded it in a stone or wooden mortar, called an usu, until it becomes a soft, chewy paste. Modern mochi is also made by machine, but it is claimed that mochi pounded in an usu tastes better than mochi that has been processed by an electric machine. 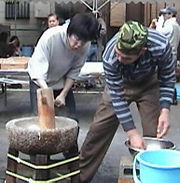 The pounding method is still frequently used in traditional Japanese restaurants and confectionaries, and sometimes in festivals and private homes. Fresh mochi can be enjoyed immediately, dipped in soy sauce and sugar or coated with toasted soy bean powder (kinako (黄粉, kinako)). It is also formed into a variety of confections and sweets. Shaped into rectangles or circles, it hardens as it is cured and can then be cooked with red beans, vegetables or soups, or toasted on top of a stove. Toasted mochi inflates to several times its original size, forming a crisp crust with a soft, chewy interior, and is especially popular in cold weather. Japanese mochi being covered in kinako powder. Japan and Korea both have similar pounded glutinous rice foods, known as mochi and tteok, respectively. The exact origin of mochi is unknown, though it is said to have come from China. The cakes of pounded glutinous rice appear to have become a New Year's treat during Japan's Heian period (794-1185). As early as the tenth century, various kinds of mochi were used as imperial offerings at religious ceremonies. A dictionary dating from before 1070 calls the rice cake "mochii." Around the eighteenth century, people began to call it "mochi." Various theories explain the name. One is that “mochi” came from the verb “motsu,” “to hold or to have,” signifying that mochi is food given by God. The word “mochizuki” means “full moon.” People of the west and southwest islands called it "muchimi," meaning "stickiness." Chimaki, a sweet mochi cake wrapped in a bamboo leaf, eaten especially on the Kodomo no hi Festival on May 5. A match-box sized piece of mochi has the same caloric content as a bowl of rice. Japanese farmers are said to eat mochi on cold winter days to increase their stamina. Samurai took mochi to the battlefield because it was easy to carry and to prepare. The sound of samurai pounding mochi was a sign that they were about to go into battle. Two layers of nian gao with a filling of sweet red bean paste. Rice cakes of various types are found in China, Thailand, Laos, Myanmar, and the Philippines. All are made using glutinous rice, pounded or ground into a paste or powder, and molded into shapes or cooked again to create various confections. There are many varieties of Chinese nian gao, made from a batter of uncooked glutinous rice flour, including the types found in Shanghai cuisine, and Cantonese cuisine originating from Guangdong. During the Chinese New Year, nian gao is also widely consumed in the Philippines, a tradition originating from the country's large population of overseas Chinese from the Guangdong region. Nian gao is known as tikoy in the Philippines. In Philippine cuisine, a rice cake, called palitao in Tagalog, is coated with sesame seeds and grated coconut. 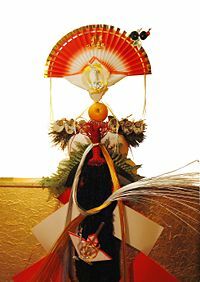 A traditionally ornamented Kagami mochi. Kagami mochi (Japanese: 鏡餅), literally mirror rice cake, is a traditional Japanese New Year decoration, consisting of two round mochi cakes, the smaller placed atop the larger, with a daidai (a Japanese bitter orange) with an attached leaf set on top. In addition, it may have a sheet of konbu and a skewer of dried persimmons under the mochi. The kagami mochi sits on a stand called a sanpō (Japanese: 三宝) over a sheet called a shihōbeni (Japanese: 四方紅), which is supposed to ward off fires from the house for the following years. Sheets of paper called gohei (Japanese: 御幣) folded into lightning shapes similar to those seen on sumo wrestler's belts are also attached. The kagami mochi first appeared in the Muromachi period (fourteenth-sixteenth century). The name kagami ("mirror") is said to have originated from its resemblance to an old-fashioned kind of round copper mirror, which also had a religious significance. The two mochi discs are variously said to symbolize the going and coming years, the human heart, "yin" and "yang," or the moon and the sun. The "daidai," whose name means "generations", is said to symbolize the continuation of a family from generation to generation. 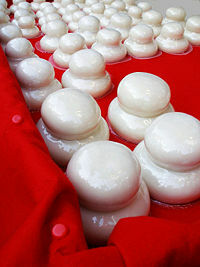 In some regions, three layered kagami mochi are used. There is also a variant with three layers of mochi, called an okudokazari, which is placed in the centre of the kitchen or by the window. Traditionally the kagami mochi was placed in various locations throughout the house at New Years’. Today it is usually placed in a household Shinto altar, or kamidana. It can also be placed in the tokonoma, a small decorated alcove in the main room of the home. Contemporary kagami mochi are often pre-molded into the shape of stacked discs and sold in plastic packages in the supermarket. A mikan or a plastic imitation daidai is often substituted for the original daidai. The kagami mochi is traditionally broken and eaten in a Shinto ritual called kagami biraki (Mirror Opening) on the second Saturday or Sunday of January. The mochi cakes are cut into small pieces and boiled with vegetables or red beans. First adopted into Japanese martial arts by Jigoro Kano, the founder of judo, in 1884, the practice has become an important ritual in aikido, karate and jujutsu studios. Mochitsuki, the traditional mochi-pounding ceremony in Japan, is often performed by traditional, rural, or wealthier households on December 29 in preparation for New Years’ celebrations. It can be performed at any time of the year, though, and is often part of local festivals and celebrations. The cooked rice is then pounded with wooden mallets (kine Japanese: 杵) in a traditional mortar (usu, Japanese: 臼), made of wood or stone, about one meter high and 30 cm in diameter. Often the rice is pounded by two people alternating mallet blows, chanting in unison to keep time. They must keep a steady rhythm or they may accidentally injure one another with the heavy kine. Between each swing of the mallet, another person puts his hand in the mortar to wet and turn the rice. The sticky mass is then formed into various shapes (usually spheres or cubes). Sakura mochi, wrapped in a pickled cherry leaf (Kansai style). Many types of traditional wagashi (Japanese traditional sweets) are made with mochi. Daifuku is a soft, round mochi stuffed with sweet filling, such as sweetened red bean paste (an) or white bean paste (shiro an). Ichigo daifuku is a version containing a whole strawberry. Akafuku is soft mochi covered with red bean paste. Bocchan dango (Sanshoku dango 三色団子). Dango (Japanese: 団子) is a Japanese dumpling made from mochiko (rice flour), related to mochi. It is often served with green tea. Anko: Commonly known as (sweetened) red bean paste, but ingredients other than azuki are used on rare occasions. An-Dango is the most popular flavor in Japan. Bocchan dango: Three dango of different colors. One is colored by red beans, the second by eggs, and the third by green tea. Chichi dango: Slightly-sweet, light treats, usually eaten as a dessert. Goma: Sesame seed dango, both sweet and salty. Kinako: Dango covered with a toasted soy flour. Mitarashi: A syrup made from shouyu (soy sauce), sugar and starch. Teppanyaki: Dango on a skewer with a tangy teppanyaki taste. Kagami mochi, the New Year decoration, which is traditionally broken and eaten in a ritual called Kagami biraki (mirror opening). Zōni soup, a soup containing rice cakes, also eaten on New Year's Day. 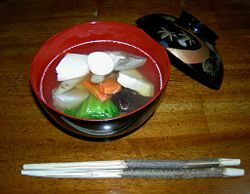 In addition to mochi, zoni contains vegetables like honeywort, carrot, and red and white colored boiled kamaboko. Kinako mochi is traditionally made on New Year's Day for luck. This style of mochi preparation includes roasting the mochi over a fire or stove, and then dipping it into a mixture of soy sauce, water and sugar, before finally coating it in kinako (soy flour). Small balls of ice cream are wrapped inside a mochi covering to make mochi ice cream. The mochi has been modified to make it soft at cold temperatures. Mochi ice cream was first manufactured in Japan in 1981 by the Korean conglomerate, Lotte, as Yukimi Daifuku, "snow-viewing daifuku." In 1993, Mikawaya began manufacturing mochi ice cream in the United States, where it is becoming increasingly popular and is sold in chocolate, mango, green tea, coffee, vanilla, and strawberry flavors. Recently, "Moffles" (a waffle like machine used to cook Mochi's) has been introduced with much fanfare. The rice is washed and soaked for several hours, or overnight. The rice is cooked as usual in a pressure cooker or rice cooker. The cooked rice is then ground with a mortar and pestle until the grains become completely fluid and sticky. This takes at least 30 minutes of grinding when done by hand. The mash is then shaped into two centimeter squares, which are placed on an oiled plate and allowed to dry for one to two days. During this time they should be kept covered in a cold dry room or in the refrigerator. Before eating, the squares are raoasted for five minutes in a pan or a toaster oven. Mochi may also be made in an automatic mochi machine, similar to a breadmaker. Mochi can also be made at home using rice flour. A bamboo steamer should be used so that the mochi will not stick while steaming. Using enough water to allow the flour to stick together, the dough is formed into a small circle, then a small amount of bean paste is placed in the center. The dough is closed over the paste, placed in the steamer, and steamed until the mochi congeals. Immediately upon removing the mochi from the steamer, the mochi must be coated in more sweet rice flour to prevent it from sticking. Warabimochi is not true mochi, but a jelly-like confection made from bracken starch and covered or dipped in kinako (sweet toasted soybean flour). It is popular in the summertime, and often sold from trucks, not unlike ice cream trucks in Western countries. ↑ 1.0 1.1 Guide to Kagami Mochi from "Manner Bijin" (Japanese) Retrieved May 16, 2008. ↑ 2.0 2.1 2.2 Kagami mochi FAQ (Japanese) Retrieved May 16, 2008. ↑ 3.0 3.1 Kōjien dictionary. Various Japanese dictionaries, including the Kōjien, testify that the kagami mochi has two tiers of mochi. Three or more tiers is not mentioned. ↑ Kagami Biraki: Renewing the Spirit Retrieved May 16, 2008. ↑ Mainstream America Embraces Mochi Ice Cream, sushiandtofu.com, All Japan News, December, 2001. History of Mochi Ice Cream and Mikawaya Bakery-Confectionery. Retrieved May 16, 2008. ↑ Nagata Kazuaki, 'Mochi' moffles reinvent the waffle, The Japan Times Online, Wednesday, March 19, 2008. Retrieved May 16, 2008. This page was last modified on 14 April 2013, at 01:31.